I wish networking events everywhere had these. I always get stuck with a plate full of food, a drink, my phone, and a person who wants a handshake and a business card. Let’s just say it gets messy. 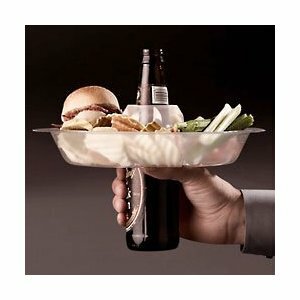 These “go plates” make it so you can carry your food and drink in one hand, so you can have another one ready to hug, handshake, or tweet about how awesome the event is. I plan on buying a set of these to have on hand for my next party. I mean, how can you not?